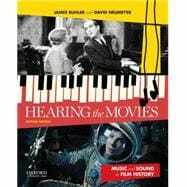 Hearing the Movies, Second Edition, combines a historical and chronological approach to the study of film music and sound with an emphasis on building listening skills. Through engaging, accessible analyses and exercises, the book covers all aspects of the subject, including how a soundtrack is assembled to accompany the visual content, how music enhances the form and style of key film genres, and how technology has influenced the changing landscape of film music. James Buhler is Associate Professor of Music Theory at the University of Texas, Austin, and has written extensively on film sound. David P. Neumeyer is the Marlene and Morton Meyerson Professor of Music and Professor of Music Theory at the University of Texas, Austin. He is the editor of The Oxford Handbook of Film Music Studies (2014), and co-editor, with James Buhler, of Music and Cinema (Wesleyan University Press). -- Mickey-Mousing: Music as Effects "Sweetener"
---- To Have and Have Not, "Am I Blue?"